When I look at a children's cartoon, I think it's just a protracted advertisement for toys. 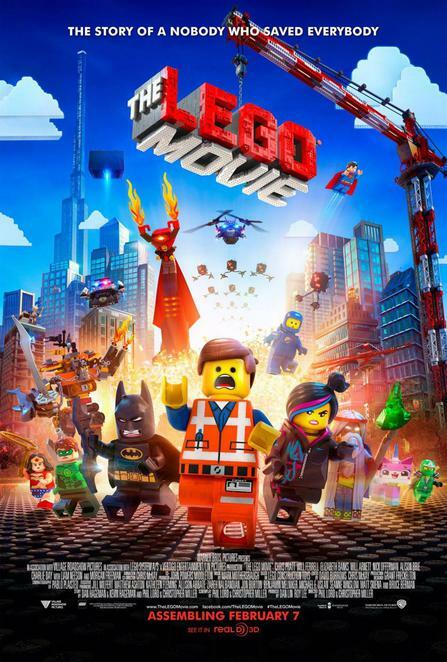 Watching The Lego Movie was exactly that, yet it was a postmodern pastiche of one. The influence of Matt Groening's iconic yellow American family was clearly evident in the use of witty references to Total Recall, the Terminator quadrilogy and the DC universe to great comic effect. Wildstyle'w line, "Come with me if you don't want to die", is one of those Simpson-esque in jokes for people who think themselves cineastes, but haven't seen anything outside the Hollywood system. These in-jokes are what could be called "icing on the overcrowded cake", whose construction is just like Lego sets in that you can interpret it anyway you like. On the other hand, Emmet, the protagonist, is just a schmo who lives his life accordion to the printed instructions that come with the kits. He is as generic as any 1980's Lego figure, living a generic existence in a town generically called Bricksburg. This is a reference to "Total Recall", whose protagonist is a construction worker called Quaid. When introduced to Emmett, he lives a life that is like the instruction sheets you get with any box of Lego, until he spots a trespasser on the building site he works on. This trespasser is a girl who leads him to a future and destiny he never thought of. In their escape from a literal two-faced Bad Cop, Wildstyle builds a motorbike out of buildings and anything she can find. Being set in a Lego universe, anything is possible and the Lego builds itself. This post modern self referentiality permeates the film, with the irony smothered on as thick as President Business's secret weapon (no, you have to watch the film to find out what it is!). Even the captions that tell you what Lego world you're in are made of the aforementioned "sophisticated interlocking bricks" (this is an actual line, by the way), which is straight out of Terry Gilliam's Monty Python animations. The worlds in the story are straight out of the Lego range, but Emmet, Wildstyle, Batman and the Gandalfian Master builder who prophesies the Saviour of the Lego universe, end up in the Cloud Cuckoo Land. This is an anarchist Utopia with no rules (instructions) , where the master builders can build anything, where the also meet up. The master builders, include Wonder Woman, Batman and Superman, making it somewhat like an advert for DC licenced products. However, saying this overlooks that this is pretty much a story that a child would tell. Anything like Superman with a super cute little unikitty who loves joyous and cute things would appear in a child's story alongside Batman. When Emmett falls through an infinite vortex, he becomes part of a subplot set in our universe. This is shot in live action, where as the Lego universe is almost the continuation of the Lego shot videos of Michel Gondry. His most famous one was The White Stripes "I'm In Love With a Girl". Only here, you can't tell whether it's filmed with Lego or computer generated with CGI. Without giving the game away, it reveals that The Master Builder is part of a child's game, which shows Lego is about stories. Though the film is thick with in-jokes and irony, this message gets through loud and clear. This almost comes across as an instruction manual for playing with the toy, as well as an advert for it. These scenes both mirror the Lego universe, but are a projection of our own world, with its rivalries and conflicts, as you'll see. It even gives new meaning to the term "social construct", as Lego's USP is that you construct a society and its stories. Even if Emmet gets the girl in the end. Yes, it has a formulaic Hollywood ending, where all is satisfactorily resolved and a new order is established, but it's your order. Isn't it?